Carefully handcrafted from 100% solid wood, this heirloom-quality dresser and mirror set presents a warm, inviting Mission look appropriate for a wide variety of home settings. With 15 drawers, the triple dresser is large enough to store the belongings of more than one person, making it an ideal piece for couples or children who share a bedroom. The coordinating landscape mirror features beveled glass framed in solid wood with sturdy support beams. Available in Amish Oak, Quartersawn White Oak, Cherry, Maple, or Hickory wood with over 25 finish options, this dresser and mirror combination is custom-made to suit your personal preferences. 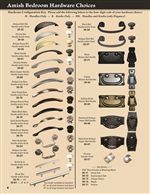 Complete the look with your choice from over 30 hardware options, ranging from traditional to contemporary styles. The Mission 15-Drawer Solid Wood Triple Dresser with 42 X 36 Landscape Mirror by Daniel's Amish at Saugerties Furniture Mart in the Poughkeepsie, Kingston, and Albany, New York area. Product availability may vary. Contact us for the most current availability on this product. The Mission bedroom collection offers a wide selection of heirloom-quality pieces built from 100% solid wood. Combining quality Amish craftsmanship with the tried-and- true Mission furniture style, this collection is marked by natural beauty, durable construction, and a simple, utilitarian aesthetic. Each piece in this collection is available with a vast array of customizable options. 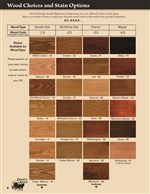 First, pick from Amish Oak, Quartersawn White Oak, Cherry, Maple, or Hickory wood with over 25 finish choices available. 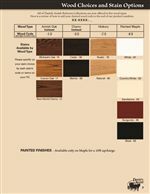 To complete the personalized look, adorn your furniture with your choice from over 30 hardware options. Handmade to suit your lifestyle, Amish Mission pieces will become a cherished fixture in your home. The Mission collection is a great option if you are looking for Mission furniture in the Poughkeepsie, Kingston, and Albany, New York area. Browse other items in the Mission collection from Saugerties Furniture Mart in the Poughkeepsie, Kingston, and Albany, New York area.